This interview, with mencantoo, is from February 2016. Before we get into the interview, let’s chat about your Valentino Happy Frog_ — you designed this yourself?!!! You just sat down and drew a picture, and voila, off you went? That’s amazing, to me. So, once you had the design, what was the most challenging part to create? 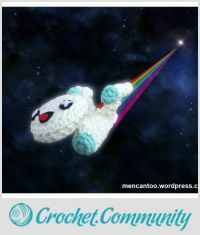 It is funny but I have never used a pattern to make an amigurumi. I just start from a drawing and figure out the basic shapes that I need, this may take some trial and error but I’m getting better. Probably the most challenging part is the expression of the face, how to make it or where to place the eyes and the mouth. My name is Fabrizio; I am originally from Italy (Piemonte) but now live in Barcelona. 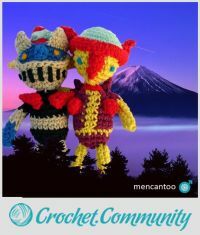 I am a big fan of Japanese culture and when I discovered amigurumis I knew that I had to learn how to make them. Knitting is just one of my passions, I also like drawing, pottery, printing and much more, anything that has to do with art and creativity makes me curious and wanting to learn more. 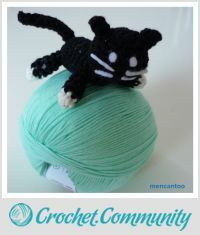 The best part comes when I manage to mix some of these skills and create something unique like the case of amigurumi and illustrations. 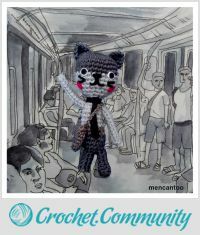 I think that the first time I saw an amigurumi was in Thailand. It was a red teddy bear that I bought from a street vendor in Bangkok; she asked me what colour I would have liked the dress and told me to come back in 15 minutes, when I returned the bear had a dress and I was fascinated. I also still remember my first amigurumi class. It was July of 2013 and I attended a workshop in Barcelona near the Picasso museum. I managed to drag my boyfriend (Llorenç) with me because I was shy to be the only man learning something so strongly associated with women only. As it was very hot, we had the class on the street, where many tourists heading to the museum started taking pictures of us knitting finding it amusing and funny. This is probably the reason for the name of my blog. 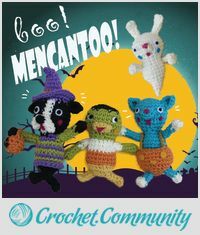 MENCANTOO, it means that men can (and should) knit without being ashamed; In Spanish ME ENCANTA also means I LOVE IT. 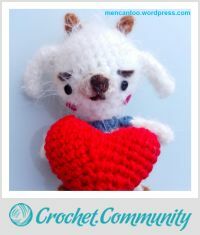 For me crochet is like meditation, it makes me calm and happy. I also like to give my amigurumis as presents; I think that they are gifts full of good energy. Be patient and don’t worry too much counting stitches. I had a teacher once that was ready to unravel what she knitted if the stitches didn’t sum up. I think that time and practice will definitely improve your skills but at the beginning we shouldn’t be too hard on ourselves, it is much better to carry on and have fun. 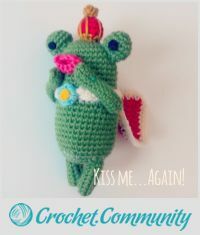 I love your cute amigurumi frog.